Singapore is pulling out virtually all the stops in preparing for a rapidly ageing society. The latest in a series of initiatives undertaken jointly by the public and private sectors is the web portal at http://www.preparecommunity.com/. 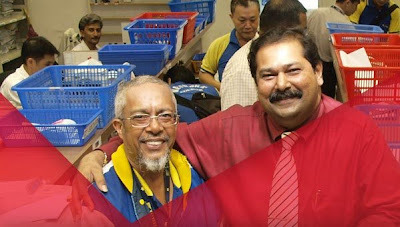 Set up by the National Traders Union Congress (NTUC) and the Association of Small and Medium Enterprises (Asme), the objective is to help small businesses get ready for the re-employment laws Singapore will introduce in 2012. While the finer details have yet to be worked out, these laws will require companies to re-hire their workers when they reach 62. The portal provides a wealth of information to help small and medium enterprises (SMEs) draft their re-employment policies well ahead of 2012. It also serves as a learning platform for companies to network and learn from other companies how to leverage on the experiences of older workers as a valuable manpower resource. 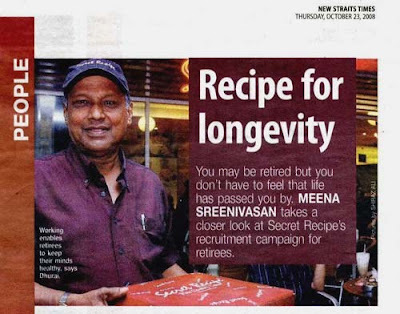 In Malaysia, the cakes-and-cafe chain, Secret Recipe, under its corporate social responsibility (CSR) programme, has 50 job vacancies reserved for senior citizens in need of steady employment to cover their living expenses. Kudos to Secret Recipe! They deserve our patronage. There may be other similar CSR initiatives, but a check of the Ministry of Human Resources website revealed nothing in the pipeline for the re-employment of older workers. Well, if ever I needed to seek re-employment, I know where I would be welcomed and appreciated!